Walking through the calle and campi in Venice, we arrive in S. Marco Square where the music coming from the cafes makes us feel in a big dancing hall. Bizantine, gothic and Reneissance architecture sorround us as if in a magical frame. Feelling the need to wear a mask or a costume to bring back ancient and fascinating time, brings us to the Canonica Bridge, campo S. Provolo and the fondamenta Osmarin. 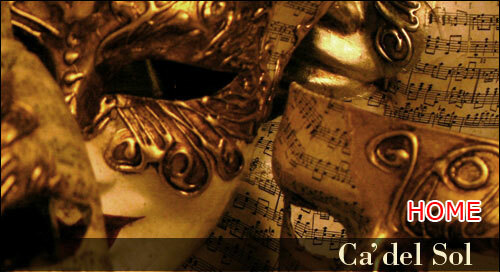 At number 4964 you will find the laboratory Cà del Sol specialized in hand made masks. Music wil always accompain you while you will have the chance to tryon the masks you prefer. You will find the famous masks of the Carneval Bauta and Colombina and the historical masks of the Commedia dell'arte Arlecchino, Pantalone and others. We are a group of artists that along with passion and professionallity produce masks and Carneval costumes, for parties theatre and any other occasion. The attention paid to the tradition and the search for new masks make Ca del Sol a very important institution for Venice. The material used in this production is carta pesta, leather, ceramic, iron. One of our exclusive invention is the use of stiffed brocade. Starting with these materials a very precious work of decorating begins, ancient tecniques taken from the theatre, as the fantastic effects must be reached at any cost: silver, gold and brass, precious fabrics, ancient varnish, Swarovski cristals etc. It all started in the 80's in collaboration with other laboratories, tacking actively part in tha newly reborn interest in the tipycal Venetian mask, which has brought back and reinvented a practically forgotten art. In 1986 we opened the Cà del Sol laboratory and shop, a creative place where craftsmen work expressing their creativity and immagination and where new ideas come up by talking to the public.